Sarada Charan Ukil, popularly known as Sarada Ukil, my maternal grandfather is something of a mythical figure to me. What is real are his art works that he left behind, some of the original which I have seen and many others that exist as photographs and picture post cards. My father, Indu Bhushan Ghosh, was his student who carried on the technique of ‘wash painting’ and I had the privilege of watching the process. My mother, Seema Ghosh (nee Ukil), the youngest daughter of Sarada Ukil and third amongst his five children is 94 years old and lives with me. She is my source of information about Sarada Ukil’s life, struggles, his reaching the height of fame and incidents related to them. It is important to describe here the type of paintings that Sarada Ukil did and my impressions of these which may or may not correspond with the views of an art critic. 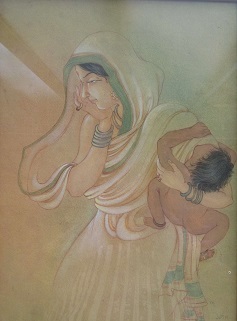 The figures were mythological drawn mainly with soft finishing and in details that seemed to merge with the background. 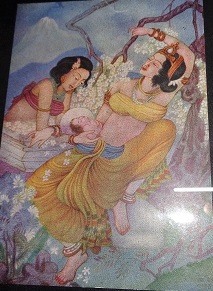 It is important to mention that he used canvas, handmade paper and silk cloth to paint on. 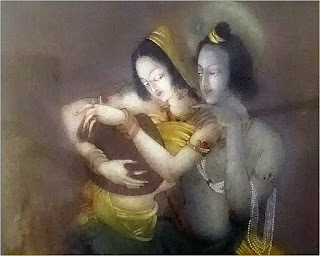 The paintings are so pleasing and mesmerising that I drift into a dream while gazing at them. For me, they rise above the normal artistic strokes and their softness engulfs me. Sarada Ukil was a gentle and soft-hearted person who loved his daughters (as much as his sons). He ‘grieved for days when his eldest daughter Sheela died very young,’ recalls my mother. The major part of the narrative is what she told me about Sarada Ukil, her father and the Ukil family. The Ukils were originally from Bikrampur1 of Dhaka (capital of Bangladesh). The family name was Banerjee, title ‘Ukil2’ granted by a Muslim Sultan, has since been used by the family. Sometime in the 1910s, the Ukils moved to Calcutta (now Kolkata). Since his early days, Sarada loved drawing and painting for which he was often reprimanded by his elders. His ‘guru’ was Abanindranath Tagore3 at the Government Art School in Calcutta. Sarada used to be always late for his classes as he had to walk a long distance from home (his father, Abhaya Charan Ukil refusing to pay for art classes or fare to travel, since he regarded it below his dignity to do so, as head of the ‘Ukil’ family). Abanindranath Tagore got into trouble with the authorities trying to save his favourite student and left the school to start another of his own. After completing his training, Sarada moved to Delhi and joined Lala Raghubir Singh’s school, famously known as Modern School, as the Art teacher. 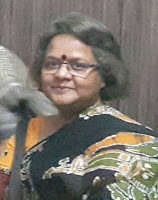 “My father always sang Rabindra sangeet6 when he drew or painted.” This reminded her of the day when Rabindranath Tagore actually visited the Sarada Ukil School of Art on Janpath7. Unfortunately, the kids had not been taken to meet him. Sarada was very fond of music and musical instruments. The Ukils owned a piano, an organ and other instruments. He encouraged his children to sing and dance and loved to take them out for long walks and visit historical monuments. He arranged to have music lessons for his daughters. An English couple once visited their home to buy a few paintings and the children were asked to sing for them. She remembers singing, “ami chini go chini tomare ogo bideshini….”8. The couple were so happy that on returning to England they sent boxes of chocolates for the children. Seema says she can actually recollect the delicious taste of chocolates even today. After Sarada bought an open hood car, the children happily jumped in and went on picnics. They visited Agra and Fatehpur Sikri with their father. Sarada would always do his own laundry9 and went to the class room after bathing in the morning. Soon the pupils came in. He had designed special benches for different types of art classes. (I (Rita) would like to state that I have also seen these later when I went to Sarada Ukil School of Art with my father Indu Bhushan Ghosh who continued to teach there). Indu met Seema at the school where she had been his student and an artist in her own right. I have a couple of her originals with me. The brothers of Sarada (Baroda and Ranoda) who were equally talented were inspired and supported by him to pursue the same profession. Soon the Ukil brothers formed All India Fine Arts and Crafts Society (AIFACS) which still exists in Delhi. 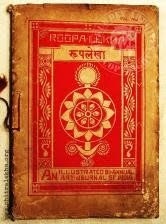 The cover page of the art magazine they brought out, named “Roop Lekha,” was taken from designs done by their mother, Kumudini. 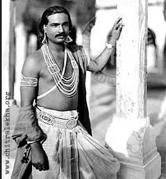 The Ukils were quite handsome and Seema recalls that her father, was selected to play the role of Gautam Buddha’s father, Raja Sudhhodana, in a film called Light of Asia, a 1925 silent film, directed by Franz Osten and Himansu Rai which is archived in Germany as Die Leuchte Asiens [can be viewed in Youtube: Prem Sanyas 1925]. Her mother Sobhona was very upset and did not speak to Sarada for few weeks because he had acted with a female actor (who was the queen and mother of Buddha) in the film. 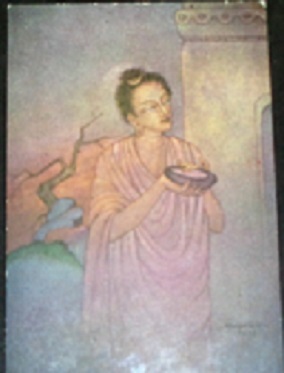 Later, Sarada painted the series on the life of Gautam Buddha or Siddhartha as Buddha was called before he attained enlightenment [there are more in this series in picture post cards], which are regarded his masterpieces. Unfortunately, except ‘Buddha in death bed’ which is displayed in the original in the Salarjung Museum in Hyderabad in southern India, the others exist only as photographs and picture post cards. We have not been able to trace the originals. There are many gaps in the story as Seema’s memory fades with age. But the early death of her father in Delhi when she was only sixteen, is vivid. She relives the nightmare. Sarada was diabetic and lost his life to an infection caused by a cut in the finger. The doctors in Delhi held conferences in the house to decide on the best course of treatment. None of them charged a penny. The Maharaja of Tripura10 had recently placed an order with Sarada for painting a series on life of Lord Krishna which he could not complete and regretted till the end. Sarada Ukil breathed his last on July, 21, 1940 in the large class room of his most beloved place, the Sarada Ukil School of Art at 66/1 Janpath, New Delhi11. Seema in particular was heartbroken. The death of Sarada at the age of 52, was not only a great loss to the family but to the world of modern Indian art as well. The life after this for Seema and her siblings was no longer happy as they were forced to shuttle between her two uncles’ families. Seema was a good student and studied in St. Thomas School, Delhi till class VIII. She found happiness when she married my father and settled into the Ghosh family. But she had to discontinue her art classes as the family became dependent on the whims and fancies of her uncles. I feel sad at the thought that Sarada Charan Ukil’s delicate techniques have gradually lost out to modern and abstract art. As I read this out to Seema, she narrated many more incidents of her life with her father which are too many to put down in one article. I hope to continue encouraging her to remember and relate more. 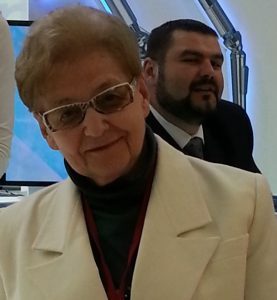 Thank you Ritadi, for bringing history to life. These are pillars of the society. Rarely do people acknowledge this, but we do thrive on the contributions of these great people.